Feb 12 Iulius E. S.
Spielberg makes yet another movie with Tom Hanks and guess what? It's completely solid! Is it a movie you want to see? Probably not. It's not a movie you need to see either (unless you are a die hard Spielberg/Hanks fan). But it's probably the least interesting thing the Coen Brothers ever wrote. The Coen brothers tidied up/rewrote the script, and their influence is obvious. You can guess which parts have their imprint. The rest of it is a straight up Tom Hanks/Steven Spielberg film, which is pretty good, but I'd love to see the Coens unfiltered version of this story. 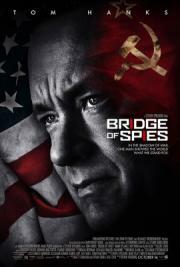 Based on real life events, 'Bridge Of Spies' has great acting performances by Tom Hanks and Mark Rylance. Rylance even won an Academy Award for Best Supporting Actor. One of Spielberg's better modern movies, a good effort by an older and more mature director. The team of Hanks and Spielberg is special, top notch filmmakers with plenty of experience working together. Spielberg successfully takes hard subject matter and makes it not only something entertaining, but also something truthful. The second half held my interest pretty well.